Entertaining and illuminating. Clever, candid, irreverent and insightful. That is how I would describe Michael Friedman's columns in the Albany County Bar Association Newsletters. 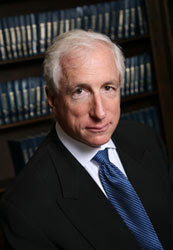 Friedman is a prominent matrimonial lawyer in the Albany, New York area. His columns in the monthly bar association publication typically deal with the recent developments in matrimonial case law in New York. But they also typically deal with the courts, lawyers, and the lives involved in such decisions, and they are typically--at once--hilarious, biting and brilliant. A recent commentary of his went unpublished. The reasons are not relevant here, but one can hazard a guess after reading it. I did have the opportunity to read it, and I thought it deserved an airing. Yes it's sharp. But like all Friedman's writings, agree with him or not, he sheds welcome light on his subject. You’ve got to have quite a sense of humor to be a New York State Supreme Court Judge these days, be you an Acting, Elected or Appellate one. Once upon a time, you were quite revered. You had authority, autonomy and respect. Your jokes were funnier than other people’s jokes, or at least enjoyed with more gusto by the members of the bar. You handled your own calendars, motion terms and trials. Then came the all powerful, all seeing Office of Court Administration, OCA to its friends. Now the bean counters have reduced our judiciary to an enormous bureaucracy, with the judges as mere cogs in a giant wheel, wasting their time filling out forms and accounting for caseloads, motions and trials. Their website now lists 28 “initiatives and programs” that accomplish virtually nothing for lawyers and litigants seeking resolution of disputes. If that isn’t bad enough, the judges haven’t had a raise since the Clinton Administration. Remember this organization did not exist a few years ago, and to most of us things ran just fine. The “request” in this year’s budget is a mere $2,709,301,640. That’s $2.7 billion smackeroos for our bankrupt state. Here’s where the sense of humor comes in. The court system wants $6.3 million for a Judicial Supplemental Support System. OCA spokesman David Bookstaver said last October this would cost about $6 million, but what’s an extra $300,000 here and there. This is a payment of $10,000 to each of the 1300 state judges. Why? According to Judge Lippman, this is not a raise but an allowance for judges to clean their robes, “commuting costs, Internet service, home security systems, life insurance and health care, marriage counseling and other expenses.” Come again? We’re denying our judges a raise, but giving them money for marriage counseling? Really? How about our Third Department judges who aren’t even married? What do they do with all the extra jing? Way, way down at the very bottom of this thing, on page 557, is a small paragraph on the renovation of the Centennial Hall in the City of Albany, formerly known as the Albany County Family Court on the corner of Lodge and Pine Streets. In case you haven’t noticed the spiffy new copper roof and cupola, this thing is for, among other things, “secure residential space for the Court of Appeals Judges while in Albany.” Yep, a nice place to sleep for $23 million. Actually the $23 million is just to renovate. The building itself was sold for $3 million, making this a $900 per square foot project. Just to put that in perspective, The Waldorf Astoria renovated the great Fairmont Hotel in New Orleans after Katrina for a $100 per square foot, and that was thought to be outrageous. All this for a place to sleep for 5 out of the 7 Court of Appeals judges who live out of town? Last year, Court of Appeals “spokesman” Gary Spencer said this is “a security issue for us.” Really? I guess the Albany Crown Plaza or the Marriott cannot be made secure enough for $26 million. Does Al Qaida or anyone really care about these guys? If you’ve been following the renovations in the Albany County courthouse for the past 8 years, you’ll note that this Taj Mahal is going up faster than track housing in Levittown, and there’s nary a sign telling anyone what it is. I wonder if the state can dispense with the judicial limo and bodyguard service since the walk to the Court of Appeals is about 100 feet portal to portal. Hopefully, because the report blames the increased costs of the court system on our jailed former bar member Andrew Capoccia on page 504, a guy who hasn’t practiced law since 2000! Tough to make ends meet when you have to compensate someone. As if all this wasn’t big enough, in a December 15, 2009 Op-Ed piece in the New York Times, Judge Lippman lamented the poor state of our state’s handling of juvenile justice. His solution? Drum roll please. “This requires a relatively simple but bold step: making the juvenile probation system an arm of the courts, rather than of the executive branch, as it is now.” Why not? Just look how well they do things now, and inexpensively too! How about this? $1.5 million for the Candidate Fitness Program. No this isn’t physical exercise, boys and girls, but a program “to ensure that only individuals of the appropriate ethical character will be licensed to practice law within New York State.” In my opinion, you can scrap that whole program. So, if you want to pass the scrutiny of the Character and Fitness Committee, be sure you are flexible with those pesky loan collectors. After all, fiscal responsibility is a hallmark of fitness to practice. Just ask the Office of Court Administration.